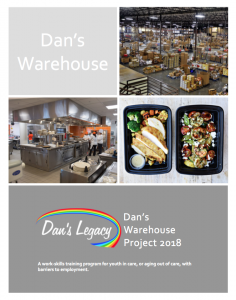 Dan’s Legacy envisions a work-skills training program for Lower Mainland youth in care and those aging out of care with barriers to employment. The proposed program covers three occupational models: Commercial Food Production, Warehousing and Vehicle Operation. Recruitment, assessment, training and placing of clients in these occupations are the primary goals, along with providing therapeutic counselling, life-skills instruction and secure housing to the participants, some of whom may be affected by mental health issues. Each model will be designed to meet the current and future needs of the representative industries, soliciting input from industry professionals and others to ensure the program provides consistency with best-practices. Instructors will be industry representatives with business connections, ensuring a greater likelihood of job placement for the students upon graduation. Youth in care, and those aging out of care, face significant barriers to finding employment within their community. Lack of a Dogwood Diploma and employment experience is prevalent amongst this cohort. With few skills, job opportunities are minimal and provide little chance for growth. Despite this bleak outlook, these youth remain optimistic, idealistic and keen to take advantage of skills training opportunities offered to them. For more information please download concept brochure below. 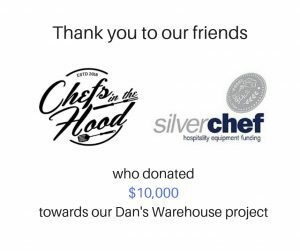 Read about the Chefs In The Hood fundraiser here!